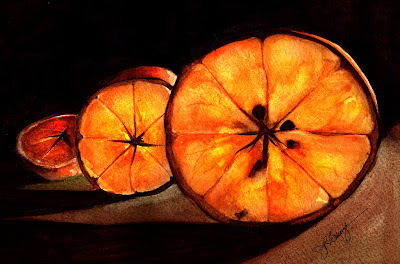 Art-a-Day: "Last Post for January"
Thought I would post something I've done that I'm fairly partial to, my "Light Through Orange Slices." And if you click the pic, you'll be magically whisked to one of my Flickr sets where there are other pieces I am particularly fond of. Thanks to Bobi and Laura G for their creation. For the most part, for me, it has been a fun month doing Art-A-Day. I've enjoyed the back and forth with friends, and I've enjoyed meeting new people. Some of the art is Outstanding!! And, I think I will continue to post here as time moves on, just for the fun of it. Don't forget to 'click the pic,' if you have the time and inclination. I clicked. I LOVE the daisies one. Absolutely love it. Magical! And we all love having you here, Jim! Wow Jim! I can almost taste the oranges!